Ophthalmoplegic migraine (OM) is characterized by recurrent attacks of migrainous headache, associated with paresis of one or more ocular cranial nerves with absence of demonstrable intracranial lesions, other than Magnetic Resonance Imaging (MRI) of the brain changes within the affected nerve. From the recent observations, it has been considered to be a type of recurrent demyelinating cranial neuropathy. International Headache Classification (IHCD-II) has reclassified OM from a variant of migraine to the category of neuralgia. 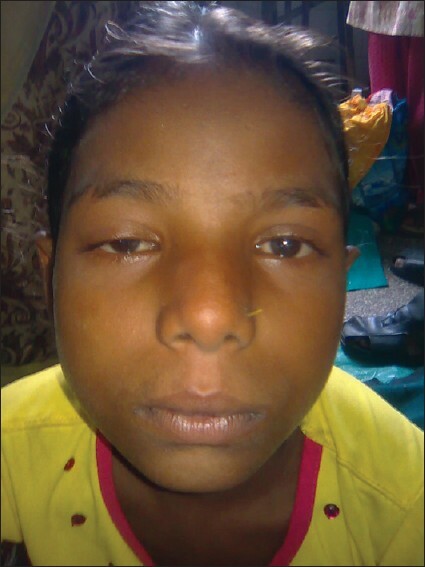 We report an adolescent girl with OM, who had been treated with steroid and showed dramatic improvement. An 11-year-old girl presented with abrupt unilateral (right) ptosis and diplopia for 3 weeks [Figure 1]. At the beginning, it was associated with severe throbbing headache, pain in the right eye, nausea and recurrent vomiting. Within 7 days, except ptosis and diplopia, all other symptoms had spontaneously subsided. She had denied having trauma, fever, diurnal variation of ptosis, tinnitus, transient visual blurring or limb weakness. Past history revealed that she had experienced similar attacks 5-6 times in the past 4 years. In each episode, ptosis was unilateral and involved mostly right eyelid, but left eyelid was involved in one occasion. All episodes had been spontaneously resolved within 10-14 days. No family history of similar disease or migraine was obtained. Ophthalmologic examination revealed incomplete ptosis of the right eyelid and paresis of the right, upward and downward gaze. Pupil size was normal in the left eye and dilated in the right eye. Pupillary constriction was normal in the left eye and sluggish in the right eye to both direct and consensual light stimulation. There was absence of proptosis or congestion of both eyes. Acuity of vision without correction and intraocular pressure in both eyes were within normal limit. Fundus examination showed no pallor or edema of disc. Anterior and posterior segment examination as well as macula, vessels and periphery were normal. Neurological examination did not detect any other cranial nerve abnormality or limb weakness. Other systemic examinations yielded no abnormality. Investigations including complete blood counts, erythrocyte sedimentation rate (ESR) and C-reactive protein, fasting blood sugar (FBS), thyroid function tests, antinuclear antibody (ANA) were within normal limits. MRI brain (plain and contrast) was also normal. OM was taken as diagnosis and oral prednisolone (2 mg/kg/day) was started, which resulted in resolution of painful ophthalmoplegia within 7 days. Steroid was continued for weeks and then tapered off and antimigraine prophylaxis (flunarizine) was started. On follow-up, she is now attack free for the last 18 months. The differential diagnoses of OM include intracranial aneurysms or tumors, oculomotor nerve schwannoma, sphenoidal sinus mucoceles, raised intracranial tension (ICT) with brain herniation, Tolosa Hunt Syndrome (THS), myasthenia gravis (MG), and diabetic neuropathy. Although reported in a young child, intracranial aneurysm is extremely rare below 14 years of age. In our patient, the normal MRI brain excludes that diagnosis. In the case of oculomotor nerve schwannoma, slowly progressive weakness of the third nerve over the years is expected. That is also a less likely diagnosis because the patient's diplopia was recurrent and she was absolutely normal in between episodes. Mucocele of the sphenoidal sinus or tumors or inflammatory lesions that invade the cavernous sinus can cause painful ophthalmoplegia. However, the headache in such disorders is of rather gradual onset and is usually accompanied by systemic symptoms or signs of other cranial nerve palsies. In the index case, such types of lesions were excluded by proper neuroimaging. Raised ICT can cause herniation of hippocampal gyrus, producing an oculomotor paresis which may be transient, recurrent and associated with severe headache. In our patient, normal fundoscopic examination and absence of findings of brain herniation in MRI ruled out that diagnosis. Granulomatous diseases such as sarcoidosis or THS can cause oculomotor nerve palsy. THS is usually associated with meningeal enhancement on MRI. Evidence of inflammation in the superior orbital apex and cavernous sinus region supports a diagnosis of THS. However, proximal enlargement with gadolinium enhancement of the oculomotor nerve within the prepontine cistern has been reported both in OM and THS. The girl had normal MRI brain; so, it was difficult to differentiate OM from THS on the basis of neuroimaging in our patient. However, THS is a disease of adults, associated with retro-orbital pain and is slow to resolve, especially without prednisone. In our patient, the previous histories of a recurrent third nerve palsy which resolved spontaneously and whose onset was associated with headache also made OM a more likely diagnosis. Ocular MG was a less likely diagnosis because there was absence of diurnal variations of ptosis and presence of pupil abnormality. If MG is highly suspected, then tensilon test may be done. Ophthalmoparesis due to uncontrolled diabetes mellitus (DM) rarely occurs in children. Besides DM, patients with hypertension, giant cell arteritis or other systemic vasculopathies may have ophthalmoparesis. However, that persisted longer than the ophthalmoplegia associated with OM. Normal FBS, ESR and CRP ruled out those possibilities. Although differential diagnosis is rather large, most other possible causes of ophthalmoplegia and headache have distinctive clinical presentations. As in our case, other causes should be excluded by proper neuroimaging. Optimal prophylactic and acute treatment is still unclear, but migraine prophylactic medications such as beta blockers and calcium channel blockers have been proposed. Steroids have been used with mixed results. As in our case, systemic steroids have shown promising results in other reports. Prognosis is good because symptoms almost always resolve, but after several episodes, some deficits may persist. 1. Charcot JM. Sur un cas de migraine ophtalmoplégique (paralysie oculo-motrice periodique). Prog Med (Paris) 1890;31:83-86;32:99- 102. 2. Hansen SL, Borelli-Møller L, Strange P, Nielsen BM, Olesen J. Ophthalmoplegic migraine: Diagnostic criteria, incidence of hospitalization and possible etiology. Acta Neurol Scand 1990;81:54-60. 3. Arasho BD. Ophthalmoplegic migraine in a 15-year-old Ethiopian: Case report and literature review. J Headache Pain 2009;10:45-9. 4. Classification Committee of the International Headache Society. International classification of headache disorders II. Cephalalgia 2004;24(suppl 1):1-160. 5. Afghani T. Ophthalmoplegic migraine. A case report and review of literature. Al-Shifa J Ophthalmol 2005;1:10-6. 6. Ravishankar K. Ophthalmoplegic migraine: Still a diagnostic dilemma? Curr Pain Headache Rep 2008;12:285-91. 7. Ramelli GP, Vella S, Lovblad K, Remonda L, Vassella F. Swelling of the third nerve in a child with transient oculomotor paresis: A possible cause of ophthalmoplegic migraine. Neuropediatrics 2000;31:145-7. 8. Levin M, Ward TN. Ophthalmoplegic migraine. Curr Pain Headache Rep 2004;8:306-9. Neera, C. and Yogesh, P. and Vinod, P. and Khwaja, G.A.